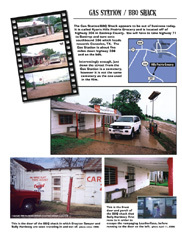 This is the official Texas Chainsaw Massacre Film Locations Tour Booklet. 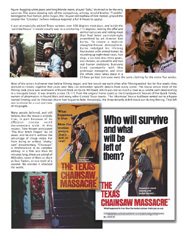 It contains over 20 full color pages with pictures and information about all of the film locations from the original 1974 horror classic. 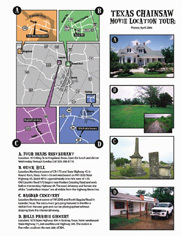 There are maps that guide you through central Texas, with pinpoint accuracy, how to get to the original macabre Leatherface family house, the BBQ shack, the cemetery, and many other locations. Included with the maps and information are pictures of what the locations look like today as opposed to how they looked 30 years ago in the movie. It has taken over 6 years to collect all of this information and pictures into one comprehensive booklet. It's like condensing the best of this web site into an enjoyable and informative booklet! If you plan on taking a tour of all the film locations as they are today, or you'd like to know what it's like to be at the film locations without having to travel hundreds or thousands of miles to see them for yourself, then this is the book to have. And if you do plan on visiting the locations, you must do so in a hurry. Several of the locations are now being bulldozed to make way for commercial property and retail stores. There has never been an urgency to view these historic sites until now. And this booklet is the perfect companion for your pilgrimage to the mortal remains of the historic locations! Each booklet is $10.00 and is available only in Adobe Acrobat as a one-time downloadable file. You can use your credit card through PayPal using the buttons below. You don't have to be a registered member to use this FREE service!